This afternoon I walked down into town to buy some cereal and to get some exercise after being stuck in the house all day. It was raining, a bit. 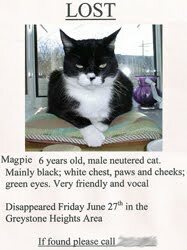 I noticed an A4 poster pinned to a telegraph pole - it was one of those 'Lost Cat' posters, with a photo of a black and white cat on it. ...and I must have won the Bridport Prize. That's the only logical conclusion, which is exciting. Of course, I will be seriously disappointed if it turns out to be a false sign and I haven't actually won the Bridport Prize after all. Even more disappointed than usual. P.S. I hope whoever put up the poster finds their cat soon. I also hope it's not quite as creepy a cat as the one I've used for my reconstruction above. That cat knows far too much; you can tell by the look on its face. Hope it's a good omen! Good luck! Hi Nik, thanks for dropping by. To be honest I'm not putting a lot of faith in this 'sign', but the coincidence made me smile. I still have a laugh every now and again at that. But yes, Dan - good luck, good luck, good luck.